A stroll along the river is often magical on its own, but when you add holiday displays filled with two-million lights, it becomes extraordinary. Christmas on the Cumberland in Clarksville is the centerpiece of Christmas Celebrations in that city. Each year, thousands of people stroll along the McGregor Park Riverwalk to see this splendid seasonal attraction up close. One of my favorite parts was the lighted “tunnel” where you are almost completely surrounded by thousands of twinkling lights of all different colors. 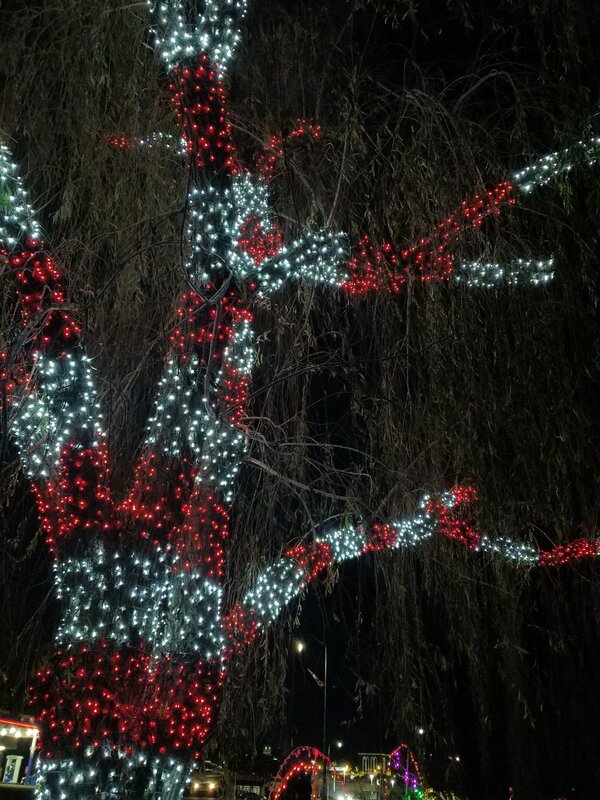 One of the large trees along the walk is wrapped in red and white lights, making it look like an elaborate candy cane creation. There are trees in blue, igloos and a Toyland too. And one of the most striking displays is found at the end of the walk next to the pedestrian bridge that takes you into downtown. It’s a salute to Ft. Campbell’s 101st Airborne Division and a call to support all the troops. Admission to Christmas on the Cumberland is free and the lights are on nightly from 5:00 until 10:00 through January 1st. While the lights along the Cumberland River definitely capture your attention, the same could be said about the simple white lights that seem to be draped everywhere across downtown. Start your walk at the Public Square. Thousands of lights accentuate each of the limbs on the dozen or so trees along the square. Big red bows are tied on the trees and the town Christmas Tree (which was not yet lit on my visit) join displays of trees on each floor of City Hall and giant wreaths hanging on the Riverview Inn and the FM Bank building. Lightposts are topped with snowflakes and bows and the light show continues around the corner down Franklin Street and on Strawberry Alley where, even when it’s not the holiday season, the lights are on every night making this one of the most charming downtowns in the Southeast. The lights aren’t the only thing to check out in Downtown Clarksville. The new Downtown Commons is home to the Windows to the World sculpture and during the holiday season, an ice skating rink. Nearby, you’ll find restaurants like Roux Americajun, the Blackhorse Pub and Strawberry Alley Ale Works where you can fuel up before an evening taking in all the lights and holiday displays. One of the most recognizable buildings to people not familiar with Clarksville may be the Roxy Theater. Sheryl Crow and her band used this historic theater as the backdrop for the video “All I Wanna Do” back in the 1990’s. The theater, which opened in 1947, now serves as a regional theater. Large neon red letters spell out R-O-X-Y on the side, and bright white lights line up under the marquee making this a striking place to see at night. Walking inside its simple décor and 1940’s charm create a welcoming environment while the compact nature of the theater itself makes it difficult to get a “bad seat.” This Christmas you can catch several special holiday performances and longer running productions like “Meredith Wilson’s: Miracle on 34th” Street or “A Tuna Christmas.” The troupe of local actors and actresses are definitely dedicated to bringing you a great evening of entertainment, so if you’re in town, be sure and take in a show. Another great way to get into the Christmas spirit is to take a visit to the Customs House Museum. Located in an ornately topped former Post Office, this museum has a little bit of everything and that includes Christmas exhibits. On the lower level of the museum you’ll find Christmas Town, a popular collection of hundreds of Department 52 items and other porcelain pieces surrounded by a model railroad. The family of Jimmy and Sue Drye donated all of the collectibles to the museum and it’s been a popular part of the holidays ever since. Nearby a couple of display cases show off other Christmas items. They include the “Merry Christmas” album from Bing Crosby and the sheet music to “White Christmas.” A few 8-track tapes like Tennessee Ernie Ford’s “Christmas” and “The Nutcracker” are also included in the display. What to do if the weather outside is frightful? While it’s highly unlikely you’ll encounter a blizzard when enjoying Christmas in Clarksville, the weather may have you opting for more indoor activities. 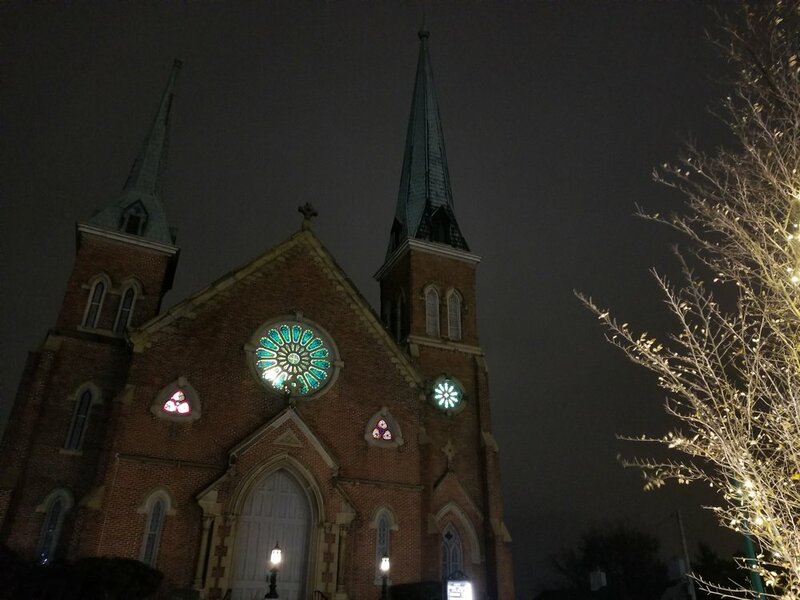 One thing to keep in mind is the abundance of historic churches in the downtown area, many of which host special events during the holiday season. One of those churches is Madison Street United Methodist Church. 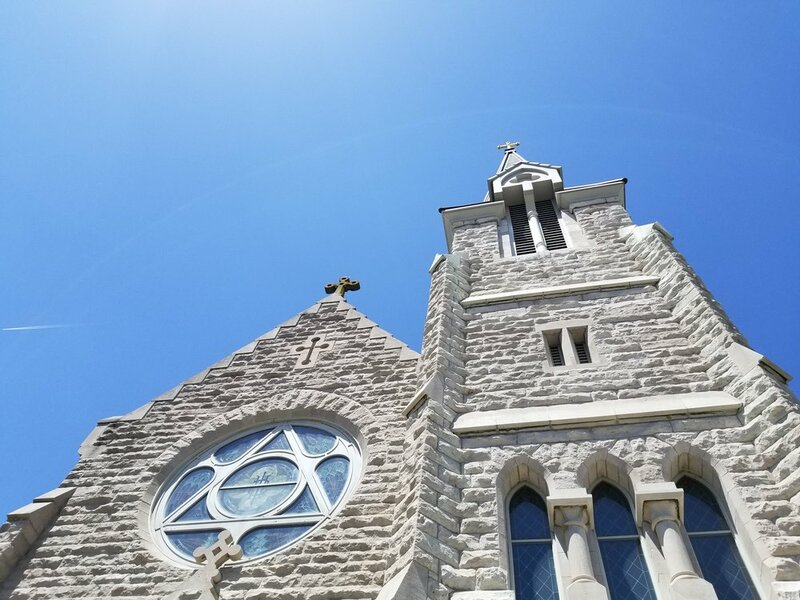 This stately building with its large metal spires and ornate stained glass windows has been a fixture in Clarksville for more than a hundred years. However, the 1999 tornado that nearly leveled much of Downtown Clarksville also took out this historic building (and other downtown churches).. Today, the church has retained its old charm even though nearly every part of it has been rebuilt. It’s the perfect setting for a Christmas Eve Service. (Check the website for more information on the Christmas Events). First Presbyterian, Trinity Episcopal and First Baptist are also close by and each offers up special Christmas activities and worship services. If you’re looking for more of an adrenaline rush on a day when the weather is frightful, then The City Forum is where you want to visit. This indoor entertainment complex on the east side of Clarksville opened in the summer of 2018. 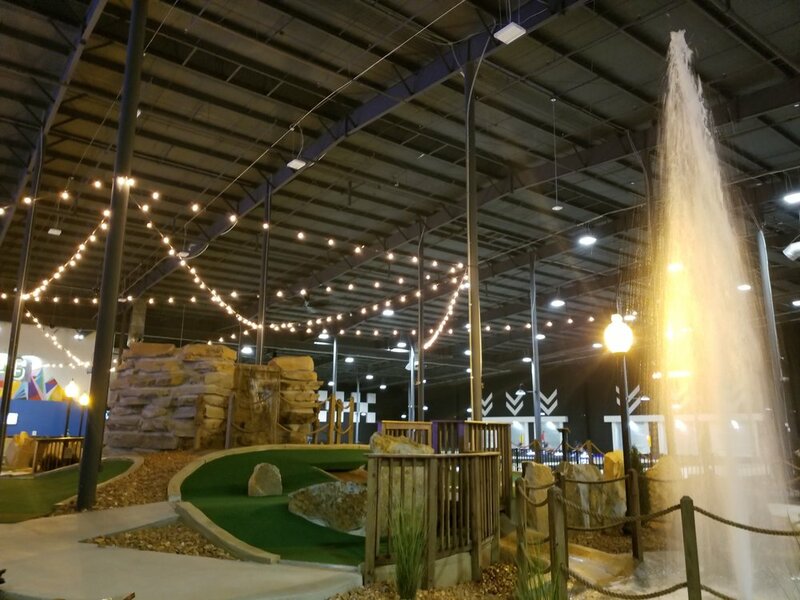 This warehouse sized attraction has a bowling alley, a miniature golf course, arcade, laser tag course, a bar and an indoor go-cart racing course with plans to add even more things in the future. And while it may not exactly be a holiday attraction, it’s certainly an experience worthy of giving someone this holiday season.